173 passed. Flowers were also sent to others and bill presented. Mrs. J.A. Brown President who was once a member of our Union obituary was read by Mrs. Jennie Baily. While in Grennell she was an untiring Church and W.C.T.U. worker, and the text text used by Rev. Herning of Wichita I have glorified thee on earth, I have finished the work [2 words illegible] me to do was very fittingly for this beautiful character. 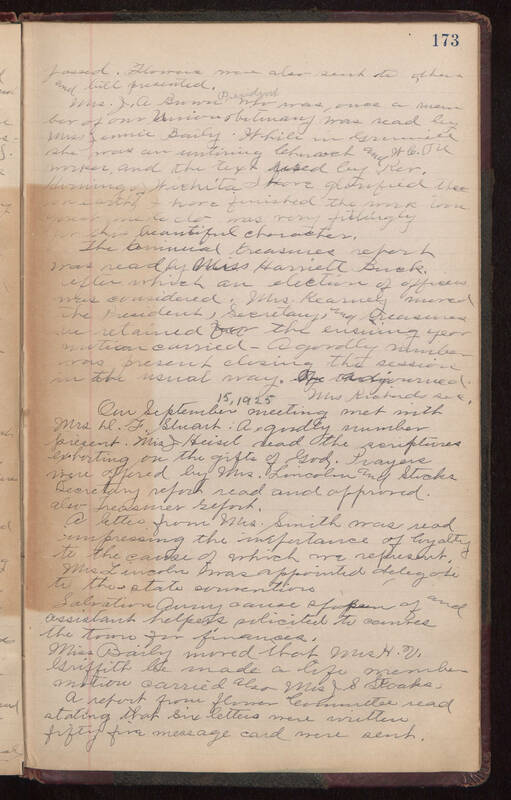 The [illegible] treasurers report was read by Miss Harriett Buck, after which an election of officers was considered. Mrs. Kearney moved the President, Secretary & Treasurer be retained for the ensuing year motion carried. A goodly number was present closing the session in the usual way. We then adjourned. Mrs. Richards sec. Our September 15, 1925 meeting met with Mrs. D.J. Stuart. A goodly number present. Mrs. J. Heisel read the scriptures exhorting on the gifts of God. Prayers were offered by Mrs. Lincoln and [Stoaks?] Secretary report read and approved, also Treasurer report. A letter from Mrs. Smith was read impressing the importance of loyalty to the cause of which we represent. Mrs. Lincoln was appointed delegate to the state convention. Salvation Army cause spoken of and assistant helpers solicited to canves [sic] the town for finances. Miss Baily moved that Mrs. H.V. Griffith be made a life member motion carried also Mrs. J.S. Stoaks. A report from flower Committee read stating that six letters were written fifty five message card were sent.